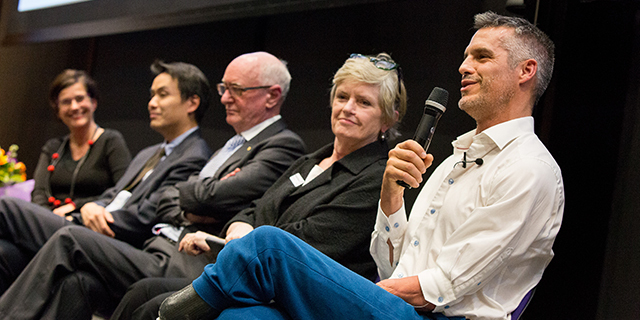 A special Dean’s Lecture Series seminar on Wednesday 17 June, held in collaboration with the Peter MacCallum Cancer Centre, brought together palliative care leaders, practitioners, and advocates to engage in a public discussion on end-of-life care. The seminar engaged a diverse audience and evoked powerful and honest discussion of end-of-life care. The evening explored areas of palliative care, voluntary assisted dying and advanced care directives, beginning with a keynote address from Californian palliative care physician Dr BJ Miller – whose visit from the US was arranged in association with the Melbourne Medical School MD Student Conference. Dr Miller shared his relationship with death and prompted the audience to think deeply about end of life care. Informed by his experiences as a patient after a life changing event, he advocates the roles of our senses, community, and presence in designing a better ending. This was followed by presentations and discussion with panel members Julian Gardner AM, lawyer and Chair of the Voluntary Assisted Dying Implementation Taskforce; Dr Kelsey Hegarty, Chair in Family Violence Prevention at the University of Melbourne, who shared her personal experience of the deaths of her parents; Associate Professor Brian Le, Director of Palliative Care at Peter Mac; and Maxine Morand, Peter Mac Board Chair.